Starting out modestly enough with 17-year-old Josh (James Frecheville) calling his absent grandmother for advice after his mother dies of a heroin overdose, Animal Kingdom seems like a gritty but familiar neo-realist character piece, introducing a boy on the cusp of manhood to a new world. Even still, as criminal uncles Barry (Joel Edgerton) and Craig (Sullivan Stapleton) antagonize the police and chomp down recreational drugs, respectively, little about the film looks particularly original, save grandma Janine's (Jacki Weaver) tendency to kiss her boys for a little longer than is comfortable. But that's where first-time writer/director David Michôd's Sundance World Grand Jury Prize winning crime drama garners most of strength, slowly building its world and a perception of the implicit status quo only to shatter these notions at the best possible moment. 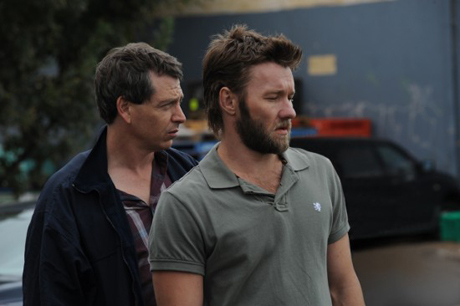 When Josh's unstable uncle Pope (Ben Mendelsohn) returns to the family abode, shaking up an already rickety situation and bringing unwanted police attention from Leckie (Guy Pearce) and a few others, the obvious morality play between good and evil looks to be set. Things aren't that simple though. As characters eventually reveal their hands and unexpected events complicate this already arduous world, the title becomes even more relevant, with survival coming at a high and disturbing price for everyone. While definitely bleak in its outlook, not shying away from some of the nastier aspects of human behaviour, an unwavering attention to character and sharp storytelling makes this Australian import stand out from the herd. Pope isn't just a one-note villain, instead having emotional vicissitudes and unsettling moments of compassion, just as Josh isn't merely the malleable cipher at the moral centre, having conflicting feelings about how to cope with a horrible situation. Each character responds to any given situation with individual logic rather than that of narrative conventions that are typical of the genre.